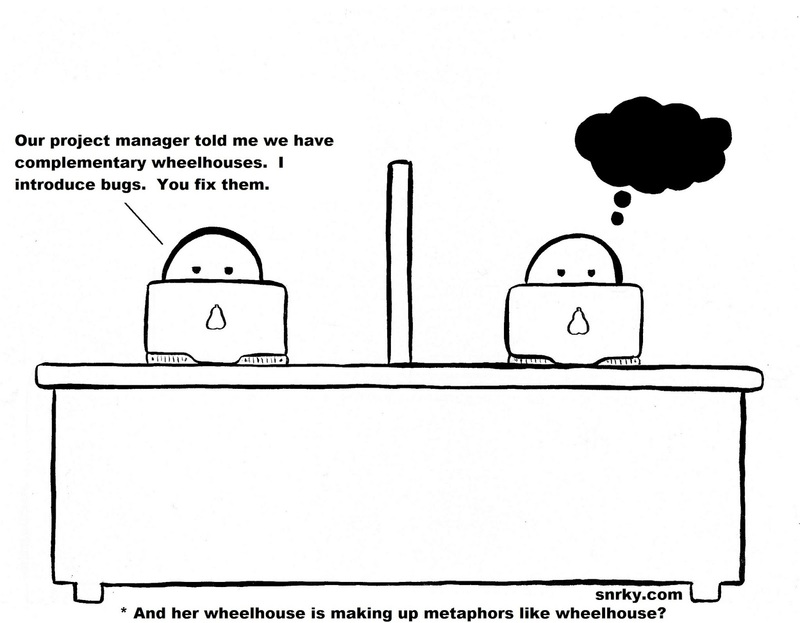 Snrky: And her wheelhouse is making up metaphors like wheelhouse? And her wheelhouse is making up metaphors like wheelhouse? I really thought I'd used this before. After all, management discussing wheelhouses was one of the things that inspired me to contribute to a stick figure comic blog. Then a friend pointed out this article about buffling and we discussed wheelhouses, pivots, and religious metaphors for business for quite a while via email. I like that 360 makes the list. That gets appended to way too many words. And I have to agree with him, Thought Shower just sounds perverse. As for Pivot, which was already the subject of a comic this week, I was in a meeting the very next day where it was used six times. Exactly six, because that was how many ticks were on my doodle pad. Snarky: Our project manager told me we have complementary wheelhouses. I introduce bugs. You fix them. Title: And her wheelhouse is making up metaphors like wheelhouse?